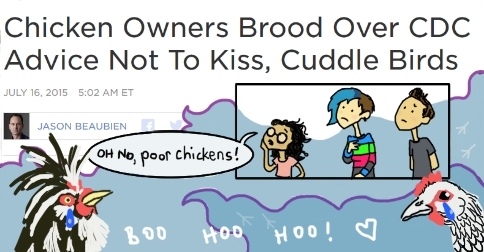 There was a news item out recently concerning the nature of friendships between humans and chickens. In it, the Center of Disease Control suggested that perhaps, just maybe, the new farming generation should create a more businesslike environment on their small hobby farms. Some people believe that happy chickens produce tastier, more healthful eggs, and seem to think that strong friendships are the key to happy chickens. In an effort to put the chickens at ease, they snuggle with them and apparently give them delicate smooches about the head and beak (and that is all, I hope). The CDC is totally grossed out, and AlexT, Dollissa, and I are OUTRAGED. As usual. We don’t know for sure if kissing a chicken will get it to grow a better egg. But we DO know that we are being consumed with jealousy that we don’t have chickens of our own! We like egg-based meals! We like the sounds chickens make! We have watched documentaries about these things! I even have a book about raising chickens! It is a grave injustice that out of the three, zero of us have any chicken friends. I made a comic out of our conversation, but do not be misled. This is not a comedy chat I have drawn. It is a true modern tragedy.